After California became a state in 1850, a board of land commissioners was appointed by congress to segregate private lands granted by Mexico from the public domain. At that time, most lands in the California desert became public and subject to federal regulations with regard to future disposition. It was the intent of Congress to sell, grant or homestead land to citizens of the United States in order to encourage growth and settlement in this part of the country. The commission appointed individuals, some competent some incompetent, to survey and mark the land in accordance with a rectangular coordinate system. The north to south coordinate termed the ”meridian-line” and the east to west coordinate termed the “base-line” intersect at a point termed the “initial point”. 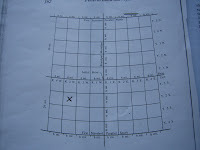 From the initial point “township” corners are measured-off and marked by surveyors. The standard township was further divided into 36 one mile square “sections” and numbered 1 through 36 starting with section 1 in the north east corner, and continues across to the west then down and across, back to the east and so forth winding up with section 36 in the southeast corner You will see these line and section numbers in red on your USGS 7.5 or 15 minute quad sheets. According to Washington’s notes, “The monument formed of two pieces of timber spliced and braced by three iron bands, 25 ft. 9 in. long extending from the surface of the earth, 23 ft. 9 in.” (a pole with two crossbars). Reflective pieces of metal were nailed to the arms to catch sun light and be visible for a distance of at least ten to fifteen miles. The base of the structure, four feet in height, was formed of boulders and filled with dirt. Because of the rough terrain finding positions along the base and meridian lines depended on being able to sight the reflectors on the monument post. For example, Henry Washington, after constructing the monument, scrambled down the mountain and proceeded to locate the westerly baseline by sighting his instruments on the post 13 miles due west of the initial point..
Washington was among the best of that group of surveyors appointed by the commission. In 1855, he extended the north meridian line and placed township corner markers up through Death Valley, a distance of over 160 miles. He noted how the corners were marked, “Set a post of chard wood and raised a mound with a trench and pit as per instructions”. Over the years, those initial corners that could be found were replaced with metal pipe and cap. The location of townships 1 and 2 north were completed in 1894 by John C. Rice who established a second initial point over 800 feet east of Washington’s point. Later still, George W. Pearson, coming up the south meridian found a third initial point between the two. Recently, it was agreed that, historically, there can only be one “initial point” - the one that Henry Washington set in 1852. The location by GPS is at latitude 34º07’12.9” north; longitude 116°55’38.4” west. I’ve not visit the initial point monuments on the mountain top -- eight miles up and eight miles down is not to my liking. However, you can find your way to Angelus Oaks on Highway 38, obtain a hiking or wilderness permit from the ranger station located there and head for the top. Washington’s instructions included a sketch of how the monument should be constructed (figure at top of the page). He probably decide that better visibility would be gained by placing the reflectors on two substantial cross-arms attached to the pole rather than dangling metal reflectors from a short cross-piece as shown.